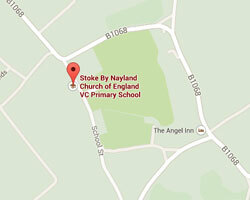 Welcome to the website of Stoke by Nayland Church of England Primary School, a successful, popular and thriving school in the heart of Constable Country. Building on our Christian foundation and in partnership with governors, parents and pupils, we aim to provide a secure and creative environment where individuals are valued, nurtured and enabled to aspire to excellence in its broadest sense. Every child is supported in the challenge to be 'the best that they can be'. Our ethos is based upon family values where children are known by us all and encouraged to be kind, considerate and look after each other-particularly older children caring for those who are younger. On behalf of the staff and governors, I'd like to open our school doors to you & encourage you to come and visit our village school.